The eighth annual HASA Fundraising Dinner and Auction was bigger and better than ever thanks to member volunteers under the leadership of Cliff Hart. The new location, the Arcata Community Center, was a big hit with the crowd that numbered 350. The sound system was great and the round tables allowed more personal interaction. Cliff has already booked the venue for next year. The food was once again excellent, provided by Brian Ferguson and Berit Meyer, owners of Ramone’s Bakery and Catering. Our sponsors donated some great merchandise and services that made all the winners smile. Please remember our sponsors when spending your money and thank them for supporting recreational fishing through HASA. Check out the photo gallery on our new website. For me, the highlight of the night was not Marlene buying the kayak, but was the kids serious and somber faces before the raffle, that turned to full smiles after. Yes! Our new website humboldtasa.com is up and running thanks to Mark McGowen, web designer. We have a lot of plans for additions and improvements but if you have any input, please use the ‘contact us’ page. You can reach Mark there if you would like help with your own website. The 7th Annual Perch’n on the Peninsula fishing tournament was held on Saturday May 7. This fun fundraising event benefits the Samoa Peninsula Fire Department. I was there defending last year’s win, but my wife, Marlene was also fishing. So I knew, my chances of repeating were slim. We fished at Gold Bluffs, arriving early, only to find a bunch of rigs parked in our spot. The beach was full of anglers but none ventured up the beach to our favorite hole. I had a great day landing 19 redtail perch, with one double, and a third place big fish in the tournament. 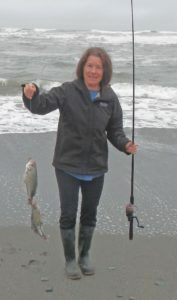 Marlene caught 31 perch, had three doubles, and a second place big fish. The winner was Tyler Jabbour with a 16.3 inch perch caught at Hidden Beach. Just wait until next year. 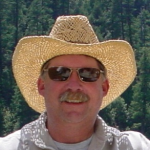 Russell Burns, 55, of Napa, has been appointed to the California Fish and Game Commission. Burns has been business manager at Operating Engineers Local Union 3 since 2006, where he has held several positions since 1994, including treasurer, financial secretary, district representative, special representative to the business manager and business agent. This position requires Senate confirmation and the compensation is $100 per diem. Burns is a Democrat. Peter Silva, 63, of Chula Vista, has been appointed to the California Fish and Game Commission. Silva has been president and chief executive officer at Silva-Silva International since 2011. He served as assistant administrator for water at the U.S. Environmental Protection Agency from 2009 to 2011, senior policy advisor at the Metropolitan Water District of Southern California from 2005 to 2009 and vice chair at the State Water Resources Control Board from 2000 to 2005. Silva was deputy general manager at the Border Environment Cooperation Commission from 1997 to 2000 and served in several positions at the City of San Diego Public Utilities Department from 1987 to 1997, including deputy director for water utilities, assistant deputy director for the clean water program and civil engineer. He was a resident engineer at the International Boundary and Water Commission from 1983 to 1987. Silva was an engineer at the San Diego Regional Water Quality Control Board from 1982 to 1983, at the Otay Water District from 1980 to 1982 and at the Los Angeles Regional Water Quality Control Board from 1977 to 1980. This position requires Senate confirmation and the compensation is $100 per diem. Silva is a Democrat. The entrance to Humboldt Bay is not the only place to suffer excessive shoaling. The Eureka Public Marina has boats sitting on the mud at low tide and the boat launch is unusable except at high water. Harbor Master, Suzie Howser said the dredging projects for the Eureka Marina and Woodley Island are held up waiting for permits. Disposal of the dredge material and Eel Grass mitigation is the issue. Miles Slattery with the City of Eureka said they will remove the maximum material allowed, (250 yards without a permit), around the boat ramp during the minus tide May 24th. The City will use an excavator and trucks to clear the mud. The Jimmy Smith Fields Landing Boat Launch has some sediment buildup but is still usable. According to Hank Seemann at the County of Humboldt, the rebuild of the Fields Landing ramp has been delayed waiting for permits. The ramp is scheduled to be rebuilt with a steeper pitch to allow launching of larger boats without getting your truck wet. It is still designed for two lanes. The ramp under the Samoa Bridge is basically one lane and a long seven miles from the ocean. The Samoa Ramp just north of the Coast Guard Station is unprotected with no dock. Launching can be a challenge and loading your boat back on the trailer exasperating. When compared with any Oregon boat ramp we have terrible facilities. The permitting process in California is ridiculous. Why does it take years to process permits? By the time the permits are approved for the Fields Landing Ramp we will need a larger facility with four lanes and three docks (not to mention a fish cleaning station, boat washdown, and parking security).